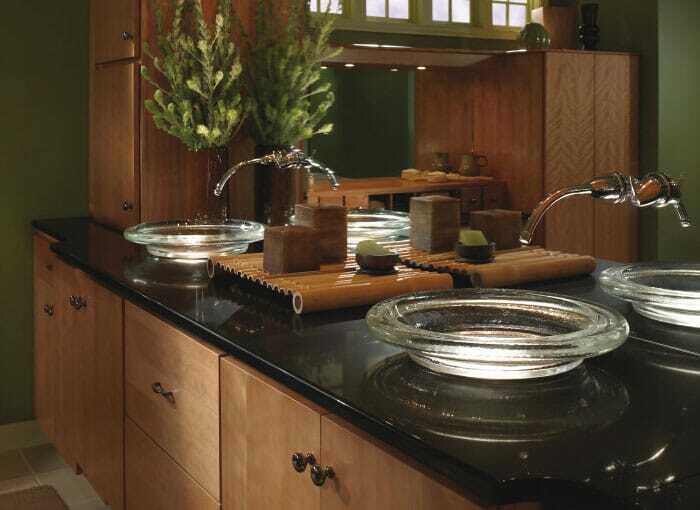 Whether you are searching for the perfect bathroom worktop offcuts to fit your budget, or you have been looking for low price designer bathroom worktops, HC Supplies have the ideal options for you. We source our bathroom worktops direct from some of the biggest names in the industry and guarantee that you will love our bathroom vanity unit worktops collection. Discover fantastic bathroom worktops cut to size in stunning materials that will completely rejuvenate your bathroom. Take a closer look at the HC Supplies bathroom worktop sale to find out exacty how much you can save. 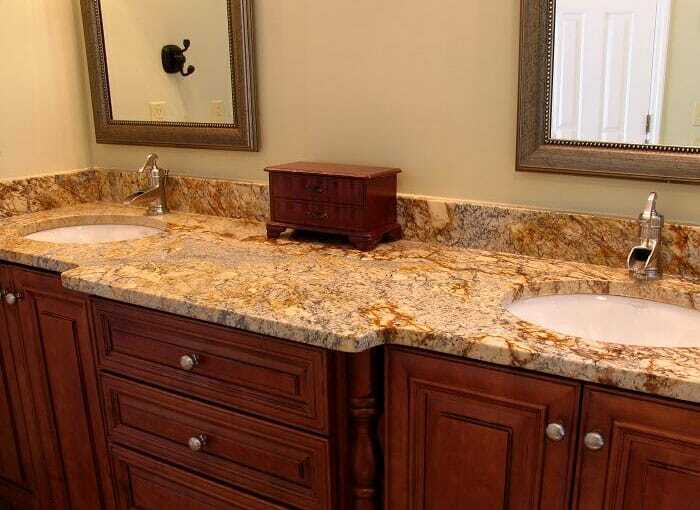 Finding cheap, quality bathroom vanity unit worktops can be tricky, which is why you need to purchase your worktops for bathrooms from a reputable stockist. 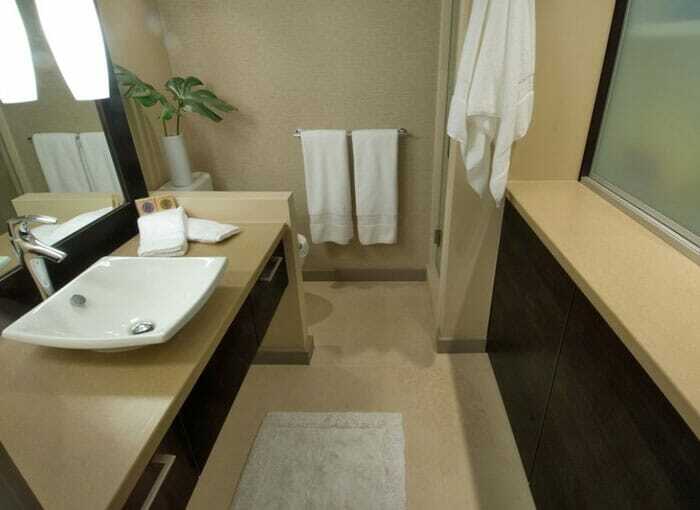 We provide top end bathroom worktops UK wide, with a choice of granite bathroom worktops, corian bathroom worktops, and many other styles - each costing less than the recommended retali price. 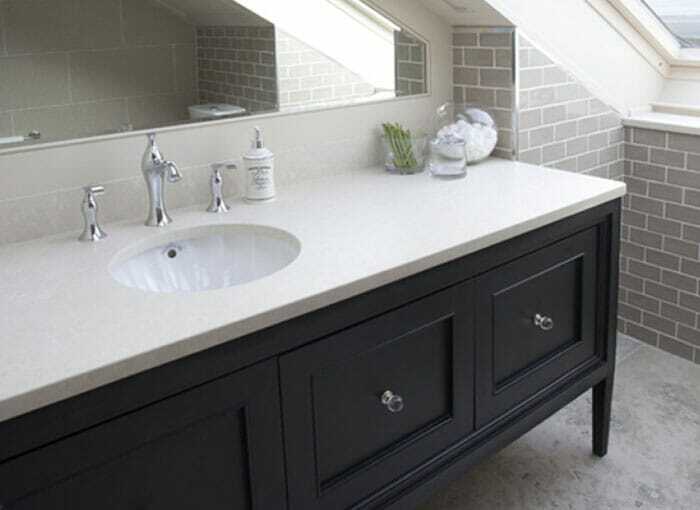 We have a fantastic array of different styles, so why stay right on trend with a black bathroom worktop, or keep things classic with a marble bathroom worktop from our worktops for bathrooms collection? We stock bathroom vanity worktops of various thickness, including 11mm bathroom worktops 28mm bathroom worktops, 30mm, and 34mm bathroom worktops. Our collection also includes bathroom laminate worktops, which are incredibly popular as they are stain and moisture, resistant, making them ideal for the bathroom environment. For more information about our bathroom worktops laminate range, or any of our stunning bathroom vanit worktops, peruse the entire collection. You can also contact us directly should you have any queries about our products. Call to speak with one of our friendly advisers, or get in touch via the online contact form. You can rely on our competent delivery teams to ensure your purchases arrive quickly and safely to your selected destination. Once you have purchased your perfect bathroom worktops, you can expect your items to arrive within 2 to 7 working days. Do you need your items to arrive on a specific day? No problem - simply call our customer services advisers after purchase and we can arrange for your goods to arrive on a date that suits you. HC Supplies are pleased to be able to ship proucts overseas, and if you are buying bathroom worktops for your holiday home, or property abroad, we can ensure they arrive safely at your selected address. 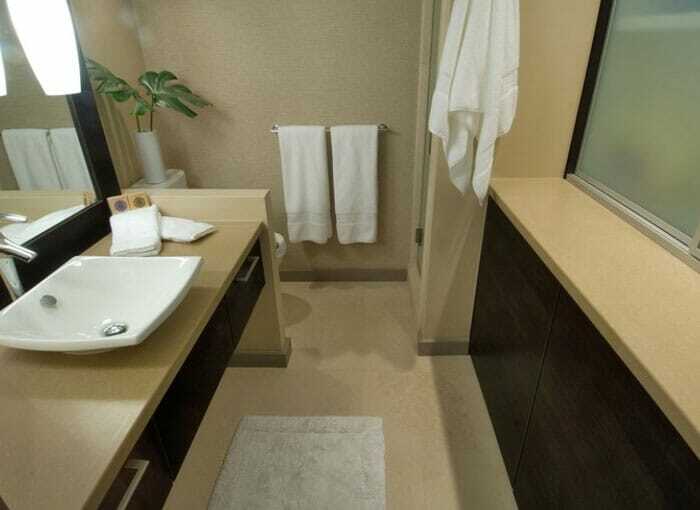 Are you unsure about how best to refurbish your bathroom? If you live within 30 miles of our Doncaster showroom, you can take advantage of our amazing design team who will take care of everything for you. For more ideas about interior design, why not pop into our showroom for some inspiration? Our friendly advisers will be delighted to give you some pointers, and are available to answer any questions you may have about our products, and which items will be suitable for your home. Each of our products has been carefully chosen from reputable manufacturers, and our customers know they can count on us to provide quality products at outstanding prices. Why waste time looking anywhere else, when everything you need is right here at HC Supplies? We offer up to 70% off the recommended retail price of top quality products, including bathroom worktops, kitchen worktops, kitchen sinks and taps, and bar stools. Our range of high end domestic goods are popular with customers from all over the UK, and beyond. As you scroll through the many different styles and designs, you will realise why we remain such a popular online retailer of big brand goods. HC Supplies are renowned for their customer care, and we are here to assist customers in any way we can. Should you have any questions about any of our products, our friendly customer services team is on hand to help. Customer satisfaction is at the forefront of everything we do, so, in the unlikely event that you are not happy with any aspect of our services, or our products, do get in touch and we will resolve the situation as soon as possible. Discover quality workmanship at budget prices with HC Supplies.